The Racing Sweater is woven densely and because of excellent workmanship it is extra voluminous. Like the classic Racing Sweaters of the late 40s and 50s it has a zipper at the neckline, which can transform it into a turtle neck. The cuffs at the sleeves are extra long and can be rolled up or worn like gloves with the provided opening for your thumb. The Block stripes on the sleeves are kept in a contrasting red and the back side convinces with an elaborate embroidery, that complements the small stitching on the front. 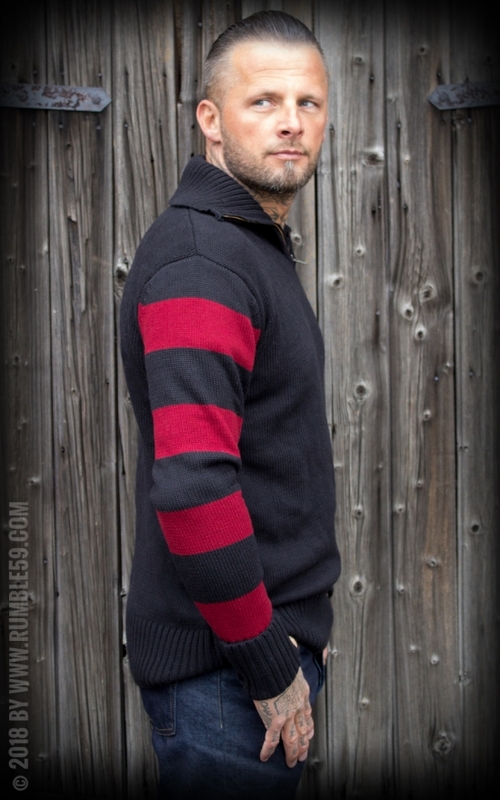 Just a cool sweater for real men - once worn, you never want to take it off again.. 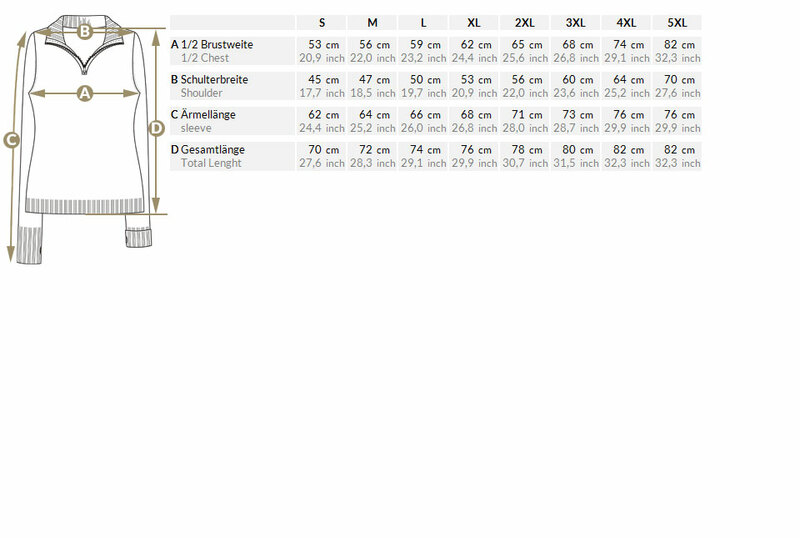 Please check our size chart for the perfect size. 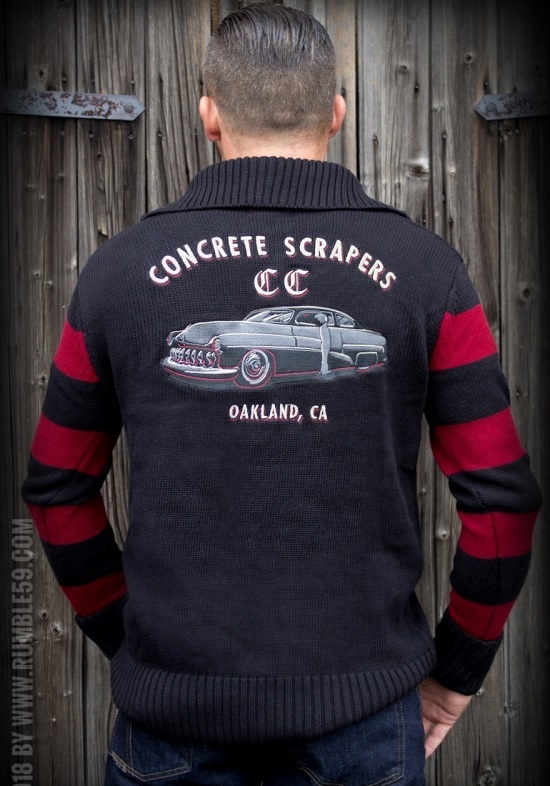 Our model Rusty Pat is wearing the sweater in size M.
Rumble59 offers a big range of 50s Racing Sweatern for rockabillies and Hotrod fans! 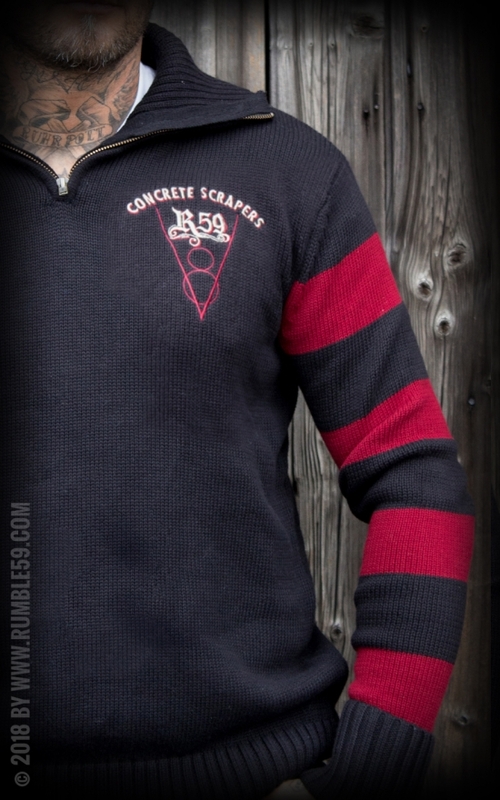 These Racing Club Sweater convinces with an authentic cut and lovely details. 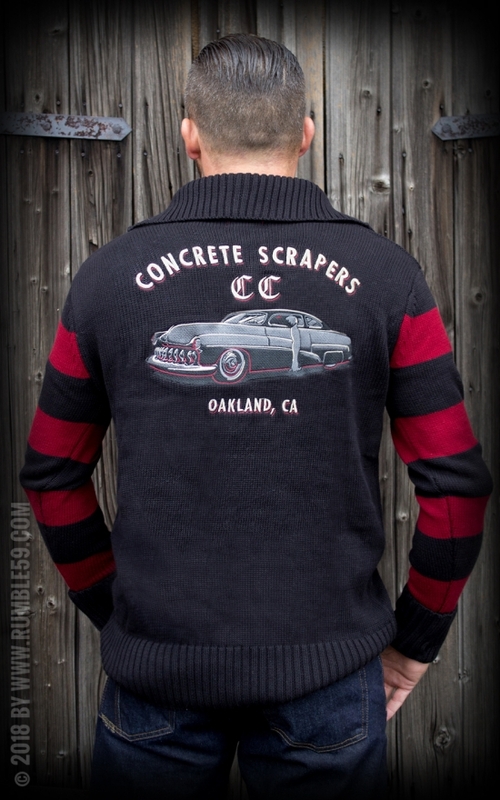 The Racing Sweater has its origin in the 20s and was widely popular up to the late 50s. Wide collars, high cuffs that went up to the waist and a thumb hole on the sleeves were features of the first sweaters. Equipped with a zipper from the chest which could close all the way up to the neck, these warming pullovers were best for motorcycle races. That is why these pullovers got popular as "Racing Sweaters". Already during the interwar period, the AMA (American Motorcyclist Association) hosted the so called "Gypsy Runs". These "Gypsy Runs" were different types of competitions, freestyle-disciplines or mountain races. The Racing Sweater, which was available in many different colors at that time, served as a platform, so that clubs, sponsors or companies were able to present themselves with their own logos on the sweaters - The birth of the Racing Club Sweater! This made Racing Sweaters very popular amongst many racing clubs in the postwar period. To clearly identify the membership each member wore a sweater with his name on the front and the club logo on the back.